Just a brief mention that, a couple weeks back, I happened across a copy of Bernhard Gál's "Installations/Installationen, a catalog of his work covering sound and light installations from the past decade. Fascinating, imaginative pieces for the most part, as near as one can tell without actually experiencing them. There's a CD enclosed with 19 tracks from various set-ups, many of which work just fine as aural art. 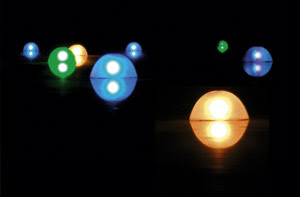 The above image is from Klangbojen, wherein eight sound/light objects are set afloat in a lake, emitting synthetic and field-recorded sounds as well as light patterns. Worth looking into if it's in your aesthetic bailiwick. Amazon link to what I imagine is the purely English edition (? different cover than mine, which has the image above). a very interesting catalogue, some great pieces & multiple approaches detailed within. Though not all of them succesful, they give the impression that Gal manages to fuse both the aural & the visual in a coherent way. Reading this catalogue was in fact one of the first times installations came into my radar. After it I've been a bit spoiled, finding some times works by respected contemporary artists lacking in exactly this field. That is, I find many of them rarely manage to provide an aesthetic experience that does not favour the eye or the ear, depending on the case. The cover you have by the way is the same that I have (which i got from Gal himself back then). Amazon seems to have the cover of the German edition. The few recordings by Gal that I have make me interestred in hearing more. His CD with Kai Fagaschinski has much to admire (Fagachinski's site collects many mostly favorable reviews of this release, at http://kylie.klingt.org/rel-serpentines.html). Like kostis kilymis, I obtained my copy of the Gal catalog from Gal, but that was shortly after its publication. The cover on my copy is the same as pictured here.